Inisgad or Canons’ Island, as it is now more commonly known, is the largest in a cluster of upwards of twenty islands that occupy the expansive stretch of water formed by the confluence of the Shannon and Fergus estuaries. On the western shore is the South-Clare village of Kildysart, which serves as the embarkation point for the island. This is the ‘Desertmorehely’ of Elizabethan documents i.e. ‘Diséart mór-thuille’ (“of the swollen tide”). The name is well-chosen for the swells at this estuarine interchange can sometimes, indeed, be very turbulent. Here, too, the islands dominate the view. Little wonder that the Anglo-Normans approaching from Limerick along these waters perceived Co. Clare as an archipelago. They picturesquely named it ‘the cantred of the isles of Thomond’, a name still preserved in that of the barony of Islands. 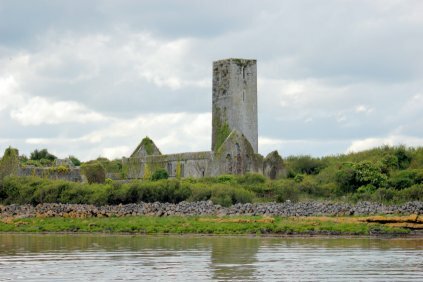 The abbey, still an impressive ruin on the north-eastern tip of the 270 acre island, was founded by a community of Canons Regular of St. Augustine probably in the very final years of 12th century. The site is one of the endowments set out in the charter granted by Domhnall Mór O’Brien, king of Munster, to the Canons of Clare Abbey in 1189, but a date for the building of the abbey itself on the island is uncertain. Thomas Westropp, who examined the ruins in the 1890s, placed some portions of the buildings in the late 12th century. There is no written reference to the church, however, until almost two centuries later, by which time it had already fallen into disrepair. A papal document of 1393 describes the place as ‘so destroyed alike in respect of its buildings as of its books, chalices, and likewise of its temporal goods as to be threatened with ruin.’ An indulgence was offered to all those who would subscribe to its repair. Though built on lands assigned to the Augustinian canons at Clare Abbey, the foundation at Canons’ Island was not a dependency of that house but maintained a separate existence throughout its history. In the papal letters it is invariably called Monasterium Beatae Virginis, and if the number of papal mandates directed to its abbots over many years is anything to go by, Canons’ Island must be regarded as one of the major religious institution in the diocese of Killaloe. The Canons Regular of St. Augustine had their origins in a reform movement instigated by Pope Leo IX (1049-54) aimed at restoring religious discipline among parish clergy in Italy by grouping them into regular communities. Though living collegially, the canons were not monks but secular clergy whose primary function was parish ministry and the care of souls. As the title implies, they belonged to the ordo canonicus, the order of priests, canons or seculars as distinct from the ordo regularis, the order of regulars, monks or religious. The canons spread rapidly throughout Europe and by 1125 over thirty important foundations staffed by Augustinian canons were functioning in England and Wales. When precisely the canons were introduced to Ireland is not certain, but there is general agreement on a date sometime in first half of the twelfth century. The person most closely linked with their introduction was Malachy (afterwards St. Malachy) who is said to have first got to know the Augustinian canons during a visit to Guisborough in Yorkshire c 1126-27. When, as archbishop of Armagh, he made the trip to Rome in 1137-38 to receive the pallia for the arch-bishoprics of Armagh and Cashel, he made a point of visiting the abbey of Arrouaise in north-western France, then the centre of Augustinian rule. He was obviously impressed by what he saw for between 1140 and his death eight years later he caused the Arroasian observance to be adopted in many parts of Ireland. With houses scattered throughout the length and breadth of Europe the canons were seen as experienced “multi-nationals” who would infuse new life into a flagging Irish Church and bring it into line with European Christendom. Moreover, their way of life had many similarities with that practiced in the native monasteries in so far as both traditions combined a communal or collegiate mode of life with an active public ministry. Indeed, the point has sometimes been made that the early Irish monks from the time of St. Patrick were regular canons rather than monks. Regular canons were known on the Continent and in North Africa from earlier still, but the distinct order that we are concerned with here, which followed a rule based on that of St. Augustine of Hippo, did not become recognised until after the mid-eleventh century. When the Irish church reforms got underway in the following century the canons were invited to play a pivotal role and many of the bishops sought to intrude them into the new diocesan chapters. In cases where this met with opposition – as it sometimes did from senior local clergy - a modus vivendi was found by establishing separate communities of Arroasian canons beside the new cathedral churches. After Malachy’s death in 1148 the Augustinian order continued to spread and many new houses were sponsored after 1176 both by the Irish and by the Anglo-Normans. By the end of the twelfth century the canons regular had become the preponderant order in Ireland. When we take a closer look at the foundation charter for the Augustinian foundation at Clare Abbey it seems of interest that it was signed in 1189, at a time when the short-lived experiment by the Synod of Kells to grant diocesan status to St. Senan’s island monastery of Iniscathaigh (Scattery) and its attaching possessions was coming under review. It seems clear that Iniscathaigh was much too small territorially to survive as a viable diocesan unit. That it was granted diocesan status in the first place probably had more to do with the fame of its founder than with any sound pastoral imperative. Comprised largely of small, non-contiguous termons, or “portions” as they were sometimes called, scattered on both sides of the Shannon estuary, Iniscathaigh was little more than a large monastic paruchia, albeit one with a venerable past. The death of bishop Aodh Ó Beacháin in 1188 provided the church reformers with an opportunity to introduce a more viable pastoral arrangement. In the shake-up that followed Iniscathaigh was reduced to the status of a rural deanery and its termons on the Clare side of the Shannon were subsumed into the dioceses of Killaloe. 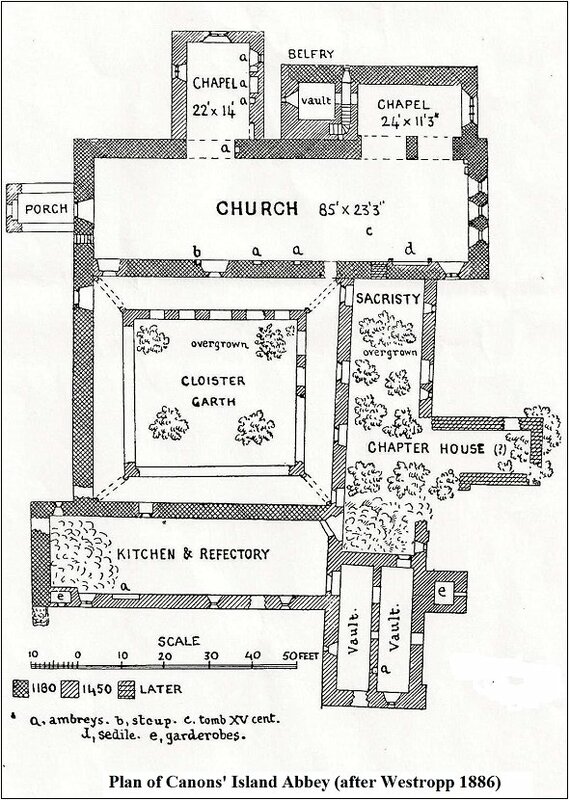 The setting up of a new foundation for Canons Regular at Clare Abbey in the following year, therefore, may not have been entirely fortuitous but can perhaps be seen as a deliberate realignment aimed at replacing archaic monastic practices with a pastoral arrangement commensurate with the new reforms. In any event it will be seen that the rectories granted to the Augustinian foundation at Clare Abbey were for the most part those which had hitherto been under the pastoral care of Iniscathaigh. Over the following centuries the canons regular of St. Augustine would play a dominant role in the administration of the diocesan church in Co. Clare. Between the synod of Kells in the mid-twelfth century and the dissolution of the religious houses in the mid-sixteenth, five houses of that order including a major foundation for canonesses, were established in the county. After Clare Abbey, which maintained pre-eminence throughout the period, Canons’ Island was next in status and its staff became heavily involved in the parochial life of the hinterland along the estuary to Killofin and as far north as Kilmurry and Kilfarboy in Ibrickane. The grant on Inisgad to the canons mentioned in the 1189 charter most likely consisted of the temporalities of a number of earlier churches on the island itself and on some of the other islands nearby. Westropp mentions a local tradition that five churches on the neighbouring islands, including St. Senan’s oratory at Inishloe, were demolished, and the material used for the new foundation. And while this tradition may not be an accurate reflection of the facts, it nevertheless points up a salient feature of twelfth century church reform in Ireland, namely the widespread hoovering up by the new European religious orders of the endowments of the flagging native monastic houses. 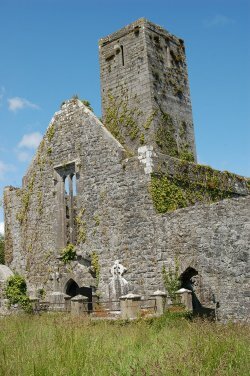 Westropp failed to find any trace of an older building on Inisgad itself, but an aerial survey conducted by the late Leo Swan in the 1980s showed that, in fact, the abbey was built on the site of what seemed to be an extensive monastic enclosure. The neighbouring island of Inisdadrum (Coney Island) had two early churches, one of which was a parish church united in cure to Inisgad in the fifteenth century. There was also a church on Inisloe -penitentiarius de Inis-Luaidhe - which tradition ascribed to St. Senan, but all traces of this have disappeared. Another church on Feenish island was ascribed to St. Brigid, ‘daughter of Conchraidh of the family of Mactail’, a contemporary of St. Senan. In the 15th century control of the abbey was frequently in contention between the Mac Giollapádraig (Fitzpatrick) and Mac Mahon families, the latter no doubt of the ruling family of Clonderlaw. Dermot Mac Giolla Pádraig was abbot from 1426-78. In 1452 serious charges were made against him by Thomas Mac Mahon who is described as ‘a deacon of Killaloe’. Thomas accused the abbot of wilful murder or of having aided or abetted murder as well as breaches of the vow of celibacy and of simony. A papal mandate was issued to the precentor of Emly diocese to look into the case and, if he found the complaints true, to remove Mac Giolla Pádraig, and install Thomas as abbot in his stead. Unfortunately such complaints were commonplace in the medieval Church in Ireland; more often than not they reflected a clash of interests between powerful rival families. It seems clear from the papal letters that mercenary trends were rampant in the Church at this period and accusation and counter accusation by rival claimants to ecclesiastical benefices were the order of the day, each seeking to have the other disqualified on the grounds of some canonical impediment. Sometimes these rivalries even led to bloodshed. In 1468, for instance, a member of the ruling family of North Clare, Bernard O’ Connor, in an attempt to seize the abbacy of the Augustinian house at Kilshanny by force, broke open the doors of the abbey, grievously wounded the abbot and killed one of his servants. The complainant in this case, Thomas Mac Mahon, had himself been given a dispensation from a ‘defect of birth’ (i.e. canonical illegitimacy) as ‘a child of unmarried noble parents’. Reading between the lines we can see that the whole affair was simply an attempt by the local Mac Mahon chieftains to get their hands on the possessions of the abbey. Eleven years later in 1463 another Dermot Mac Giolla Pádraig, who is almost certainly the abbot’s son, was also given a dispensation from ‘defect of birth’ as the son ‘of an Augustinian abbot and an unmarried woman'. In the event the abbacy remained in the Fitzpatrick family for virtually the whole of the 15th century. Such a state of affairs was by no means unusual for by that time the Church in Ireland had become almost entirely dynastic. For the greater part of the 15th century the canons functioned as the working clergy of the surrounding parishes including Kilmaleery on the opposite side of the Fergus estuary. Bishop Mahon O Griobtha of Killaloe who died on the island in 1482 is buried in the abbey but his tomb has not been identified. At the dissolution of the abbey by Henry VIII the property was described as consisting of four acres of arable land, fourteen acres mountain and pasture together with some islands nearby and the tithes of Kildysart and the vicarage (the vicar’s share of the tithe) of Kilchreest (Ballynacally). It was granted to the Earl of Thomond. It remained part of the Thomond estate until the seventeenth century when Henry, 7th Earl of Thomond (+1691) granted the property to Richard Henn of Paradise, Ballynacally. The great majority of the houses of nuns in Ireland adopted the Arroasian rule. The first of these was St. Mary’s Abbey at Clonard which became the head house in Ireland for all the Augustinian Canonessess until 1223-24 when Kilcreeventy in Galway became the head house for Connacht. Many of those ‘Arroasian houses’ were at or near places which had houses of regular canons. Some, such as Killone, had significant possessions of churches and tithe but others were just small communities at centres which have disappeared without a trace. Of these a small number may still be identified by place names such as Ballynacally (Baile na Caillaighe) in the parish of Clondegad or Cahernagaleagh in Dysert parish, at both of which a tradition survives relating to communities of nuns.